Inversion table therapy is the latest treatment for people who want to ease chronic back problems. It’s a non-surgical treatment that uses gravity to straighten and decompress the spine. Being suspended upside down for a few minutes allows your spine to decompress and stretch. Inversion table therapy releases the tension caused by being in standing and sitting positions for long periods of time. Shifting the body’s gravity enables your spine to rest and be relieved of constant pressure. There are a lot of advantages to doing inversion table therapy. Aside from addressing spine issues, it also enables those with serious conditions like osteoarthritis and sciatica to rehabilitate without surgery. You don’t have to worry about debilitating pain. Inversion is a preventative treatment for back issues. Especially when most people nowadays have largely sedentary lifestyles, many are predicted to suffer from chronic problems. Regular inversion can help maintain spine health and give you a more upright posture. And if that’s not enough, inversion table therapy is also known to boost blood circulation and stimulate different organs like the heart, lungs, and digestive tract. This in turn improves your body’s overall functioning and immunity. Truly, inversion table therapy is beneficial to your health and wellbeing. There are a lot of brands that sell inversion tables. It can get confusing which type of table best fits your needs as well as your budget. Ironman is one brand that is known as an authority in the arena of inversion tables. Paradigm Health & Wellness is a South Carolina-based company that represents the Ironman brand for inversion tables. Ironman is synonymous to incredible strength and durability. Hence, their inversion tables are built to be the best in the market today. These inversion tables are designed to address customers’ needs and innovate the art of inverting. Ironman products are built with precision using only high-quality materials, guaranteeing that they are top of the line in the industry. 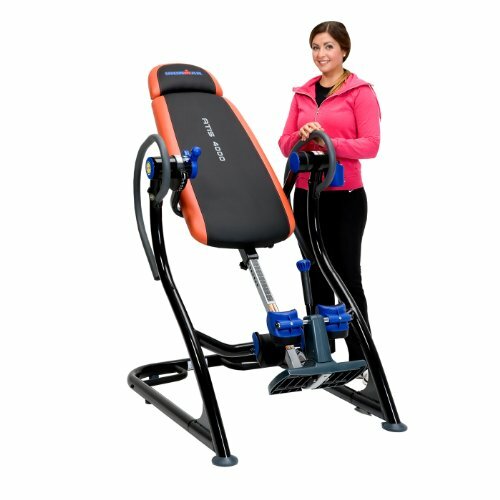 One of the best inversion tables available today is the Ironman 4000 Abs Inversion Training System (ATIS) Table. 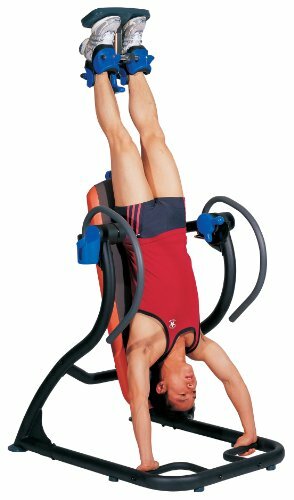 This piece of equipment provides added features that target core training while inverting. 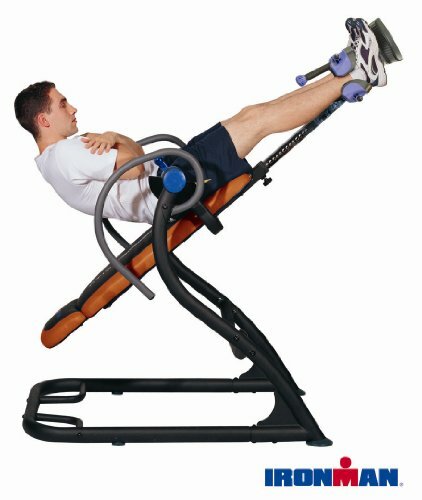 With this inversion table, you can combine inversion with intense abdominal exercises. You can work the abdominal muscles, and afterwards experience body stretching and relaxation through the inverted position. This inversion table model gives you an additional dimension to your inversion treatment. How can the Ironman ATIS 4000 Inversion Table be used for therapeutic and fitness purposes? Well, it’s outfitted with an angle locking mechanism. On a typical inversion table, a tether strap is used to stop the rotation at a desired incline. This equipment instead uses a braking gear. The gear allows you to stop the rotation at virtually any angle you need. With the table locked in place, you can perform ab exercises and core training. Both mounting and dismounting are made easier with this lock feature. What’s more, this inversion table has a “Smart Gear” that locks at 10 different inverting angles. Whatever type of core conditioning, you can do it on this inversion table seamlessly. Athletes and fitness enthusiasts who are looking to maximize their inversion table treatment prefer the Ironman ATIS 4000. Imagine, in just a few minutes a day, you can stretch your spine and at the same time build your abdominal muscles! The Ironman ATIS inversion table has a tubular steel frame with a powder-coated finish that gives a sleek look to the equipment. Tough floor stabilizers are covered with rubber for a skid-free inversion experience. The backrest is covered with 2.5-inch thick memory foam that enables the user to be comfortable during the session. There’s also a headrest for extended support. A detachable lumbar pillow provides additional support and comfort as well. Meanwhile, wide oval tubing serves as handgrips on both sides of the table. These handgrips allow maximum stretching while inverting. The ratchet-gear locking system comfortably secures your ankles in place. And a large foot platform makes it easy to get on and off the table. The inversion table has long safety handles on each side, making inverting and exercising secure, regardless of your weight and build. In fact, this table is ideal for heavier individuals who want a stable inversion treatment. The table can support weights of up to 350 lbs and heights of up to 6’6”. There’s also a side holder where you can store your phone, eyeglasses, and other articles while inverting. This table is quite an upgrade compared to other models out there because with the ATIS 4000, you can invert securely and comfortably even without a spotter. Some of the most common ab routines people can perform on the ATIS 4000 Inversion Table include hanging crunches and twisting side crunches. There are 10 different angles you can lock the table at. Hence, you can gradually make the workout harder depending on your strength. What’s great about inverted ab exercises is that they’re more challenging than the typical lying position. You’re required to do fewer reps, which means your workouts are shorter but still quite intense and effective for those abs. The angles the table can lock at cannot be done in the gym. Only with the ATIS 4000 can you get a customized inverting and core training experience. Because these exercises help strengthen your core and back, they are a great form of preventative maintenance. 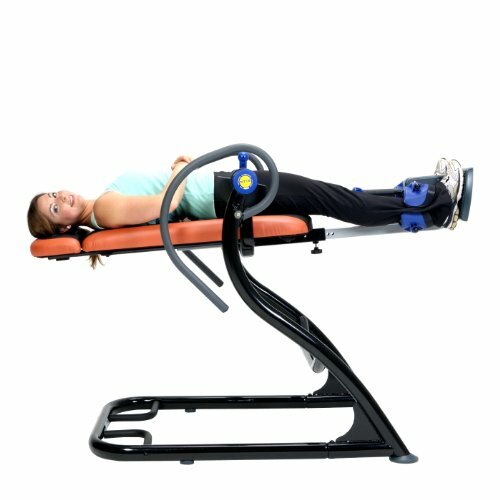 With this inversion table, you get to have a fast and personalized way to make your body stronger. The Ironman ATIS 4000 Inversion Table has these dimensions: 58 inches length x 35 inches width x 62 inches height (147 cm x 89 cm x 155 cm). It weighs about 111 lbs (50 kg), making it relatively easy to move and transport. However, this model cannot be folded into storage, which means you cannot hide it away when you have guests coming over. So, you’ll need to make sure to put it somewhere spacious for regular use. Assembling this piece of equipment is pretty straightforward. Just review the manual, and in about an hour or so you’ll be able to put all the parts together. There are tools that come with the unit for assembly purposes. The device is a bit heavy, so it would be ideal if you have someone else to assist. And if you don’t have time, you can always have it assembled for an extra fee. The ATIS 4000 has a 1-year limited warranty. Made of tough, durable materials and well-built to withstand heavier weight. Innovative 10-angle locking feature blends inversion with core muscle exercises. The foam backrest and headrest, along with the secure handles and foot platform, all offer a comfortable inversion treatment. Allows gradual progression of workout depending on your skill level. Assembly is quick, and you’re provided with all the tools and instructions necessary. Cannot be folded for easy storage. At 111 lbs, it is heavier than other inversion tables, although this helps keep it stable and secure. Some users have reported locking mechanism issues. Mechanism can sometimes be hard to adjust. Pricier than other inversion tables. 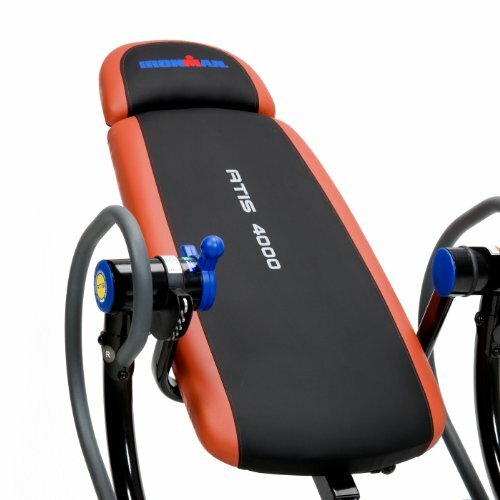 The ATIS 4000 model is different from the Ironman IFT 4000 (read our review here), another inversion table from the same manufacturing company. The latter has a heating mechanism inside the foam that produces natural heat to help relax the back during inversion. The IFT 4000’s ribbed foam backrest radiates low-temperature heat (up to 140°F) that increases the overall comfort and soothing effect you get from inversion table therapy. 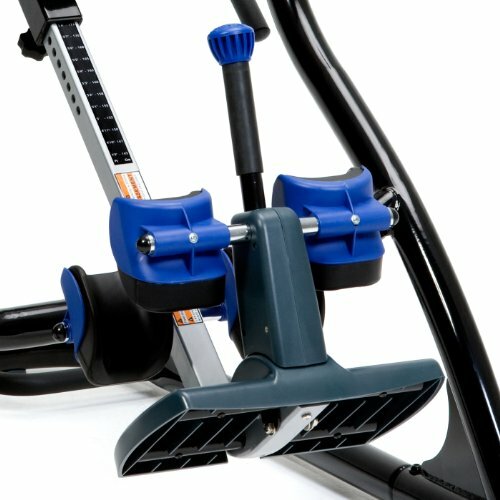 Although the IFT 4000 combines inversion with heat treatment, it is not suited for ab muscle exercises. It doesn’t have the amazing locking feature that the ATIS 4000 has, which limits its incline to only three inversion angles. If you’re after combining an athletic routine with your inversion treatment, the Ironman ATIS 4000 is still the better option for you. With inversion table therapy, your back pains can be alleviated. It’s one of the best ways you can prevent worsening backaches and rehabilitate any spine issues you may have. If you’re planning to acquire an inversion table, start with the best version available. The Ironman ATIS 4000 is an impressive piece of equipment that gives you the total body treatment. By combining inversion with ab exercises, you can build back strength and core strength at the same time. The 10 different locking angles offer significant variety and customization to your therapy and workout sessions. And with the foam cushioning and sturdy foot stabilizers, you can feel totally secure when using the device. So, start incorporating inversion and core workouts into your daily routine and purchase the ATIS 4000 today.